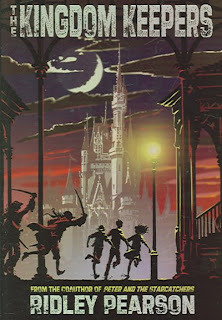 I am a big fan of the Disney parks, not to mention the films, cartoons and characters, and when I heard the premise for this book, I thought it sounded like great fun. Finn Whitman is a young teen living in Orlando, Florida, and his life is like most other teenagers, except for the fact that he is one of only five kids chosen to be the models for Disney World's holographic tour guides, guides that seem like normal humans but are actually holograms, projected images that people can walk right through. What Finn and the other four kids do not realize, is that they are linked to their DHI (Disney Host Interactive) in a mysterious way, and when they are needed to help protect the park, they travel their, in their dreams, and wake up inside their DHI bodies. The magic of Disney, it turns out, is a powerful thing, and the villains of the park - the Overtakers - are hatching a plot to extend their reach out into the real world. Because the DHI teens are part human, part "character," they are able to see things and do things that regular humans cannot. Walt Disney envisioned the rise of the Overtakers as a possibility, and he left a quest, a puzzle, and some hints for solving it. The Imagineers have failed to solve that puzzle, but they hope that the teens, with their unique abilities, may be able to. I really wanted to like this - and there were things about it that I did like; don't get me wrong. It is fun to imagine what happens in the Disney parks at night, and certainly to imagine being in the unique position of being able to protect the world from villains such as Maleficent. Finn is a likable guy, and the behind-the-scenes glimpses of the park, its secret tunnels, hidden passages and Escher staircase are very cool. But there were aspects of the book that did not work so well for me. Wayne, the elderly Imagineer who recruits Finn, tells him that each of the DHIs were chosen to play their roles for their special abilities and gifts that would help them defeat the Overtakers. Of the five, there are three boys and two girls. One boy, Philby, is smart and pitches in right away, but the other characters, particularly the girls, are fairly weak and don't accomplish much. I was expecting a fun, Mission-Impossible type of team, but was disappointed. The puzzles are solved through convenient wild guesses that turn out to be right - one puzzle is even solved, not by the "clever" girl, but through total chance. I never really bought the premise that Disney Imagineers, unable to solve Walt's puzzle, would make DHIs of kids and expect them to do it. Why kids? Why not themselves? It's never addressed. I also kept wondering why, if the villains are coming to life through people's belief in them, there aren't any heroes to defend the park. We catch brief glimpses of Winnie-the-Pooh and Chip and Dale, but there's no Buzz Lightyear or Mulan anywhere in sight. I had some issues with Finn and his mother, as well - she keeps accusing him of sneaking out of the house at night, and he insists he hasn't - can't the woman just open his bedroom door to see whether he's in bed? He tries telling her the truth, and we never really see the outcome of that scene - it's glossed over a little too conveniently. The bottom line is that I never felt that I was able to completely believe in the story - there were simply too many unaddressed issues and convenient coincidences, and that was disappointing. 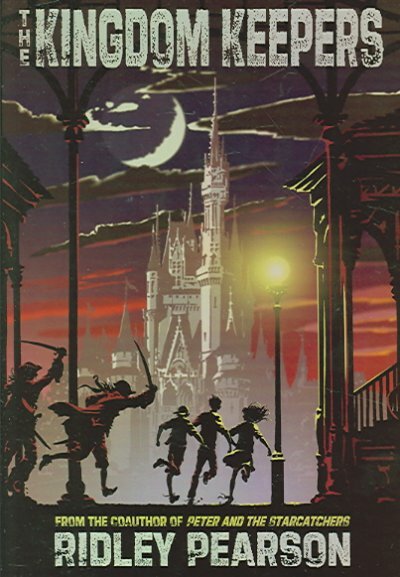 I think this is the type of book that kids will enjoy for the fun of it, particularly the creepy but not-too-scary scenes with nasty pirates from the Pirates of the Caribbean ride,Maleficent, and a particularly memorable confrontation in It's a Small World. My library shelves this in the YA section, but aside from it being a little dark and creepy, I'd say this is appropriate for younger, interested readers as well. I've recommended it to my 11-year-old daughter, who is sure to enjoy it, but I'm not planning on continuing the series myself. Big A little a: "Finn Whitman is a likeable character--a normal boy caught up in an abnormal situation. His mom is a riot too." Jen Robinson's Book Page: "I enjoyed the behind-the-scenes Disney details of this book, and the likeability of the main character." Words by Annie: "This story's plot was full of twists and turns. The characters were very well developed...and I wish I could be a Kingdom Keeper!" I bought this over a year ago (I think) when it was in the bargain section for $3.99. ;) I still have not yet read it though. I had to laugh at your "can't she just open the door and see if he's in his room" comment. HAHAHAHAH!! Parents. Since we seem to have similar tastes in books I am wondering if I will have the same reactions as you when I do finally get to the book. Not going to read it now because I am just about to start the 4th Suddenly Supernatural book as soon as I leave this comment|! *dances* I even rushed out to the store last night when I saw they had just received it! Wooohooo!! Cat - I'll be very interested to hear your views on this one. It is a lot of fun, but I was never able to fully buy into the whole scenario. That is SO exciting about the new Suddenly Supernatural book. I have it on hold at my library, so maybe it'll be in next week. I love that series! How interesting about that book 25 years before Dracula! VA Gal - Yes, it is interesting to see where all these themes and stereotypes started out.